The Platinum Lounge is a daily happy hour where filmmakers and platinum pass holders have been mingling and unwinding at the end of the day. It's a hidden gem of the SBIFF because it tends to be casual, mellow and unpretentious while still offering all the best perks of the SBIFF after parties. Namely: friendly company, a cocktail or two, and a variety of small bites to graze on. This year's Platinum Lounge has been taking place at the Blue Agave. It's their first year hosting the Lounge and with their upper floor set aside for the event, it's the perfect restaurant for it. 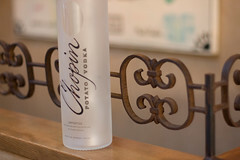 The usual beverage zone is stocked with Chopin cocktails, Santa Barbara Collection wines and Stella, and it's manned by SBIFF volunteers. This allows the Blue Agave staff to focus on shuttling the steady stream of nibbles up to the second floor. And after a long day of film festival goings-on, the attendees are grateful for the opportunity sit down, meet each other, network a little, and have some snacks. 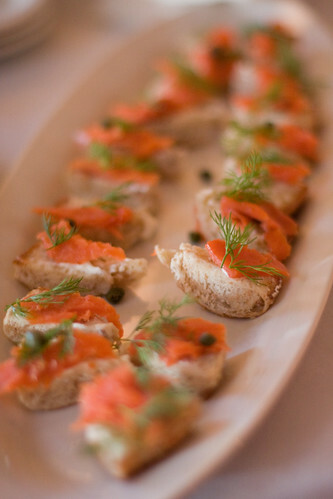 My favorite so far has been the smoked salmon with capers and dill on baguette. Really, you can't go wrong with this. The quesadillas turn out to be quite the exotic snack to most of the visiting Europeans. 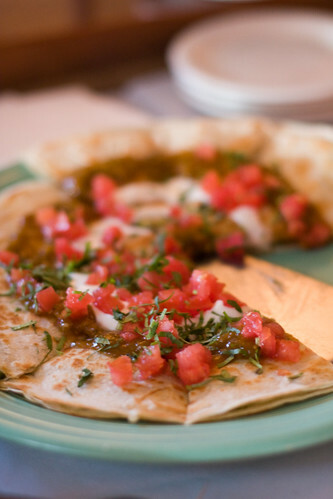 But these in particular are a geat introduction as they are topped with fresh pico de gallo and caramelized onions. Delicious. 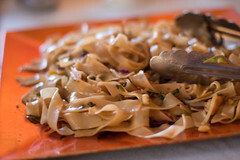 For those seeking oriental flavors, the Blue Agave offered a crunchy asian salad, and a cold noodle salad. Both were good, but a little challenging to eat as finger food. 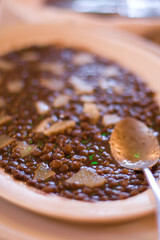 This dish above left was puy lentils with manchego cheese, reminiscent of southern Spain and north Africa. 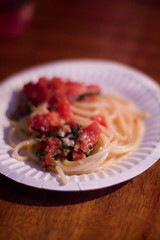 On the right, spaghetti with a fresh tomato sauce. 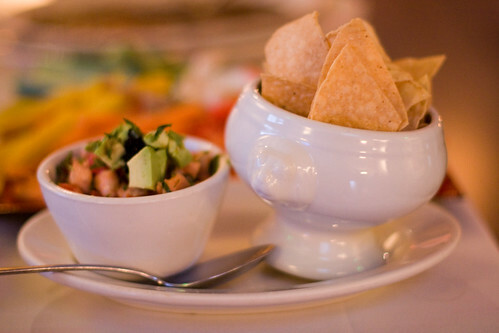 Salmon ceviche with fresh avocado and tortilla chips. 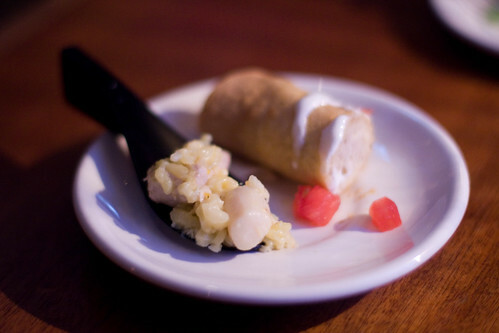 A morsel of scallop risotto on individual spoons, and half a chicken taquito. 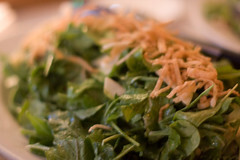 The most underappreciated item on the table was the crudite. 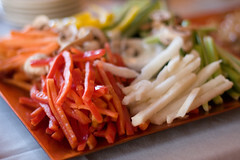 Admittedly a generous pile of crunchy vegetables to begin with, this assortment would still have bits on it when all the other platters would be stripped clean. People, eat your vegetables! Finally, the beverage that makes everyone loosen up and have a good time, VOKKA.